The Most Improved Woman of the Year category received 30 nominations and 53 votes for the 2016 Horsepower & Heels Women of the Year Awards. This recognizes women who have made significant strides at their trades. 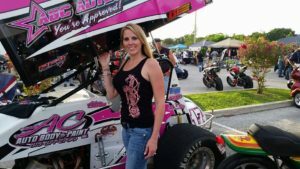 Horsepower & Heels is proud to announce the winner of the 2016 Women of the Year Most Improved category – Sprint Car Owner/ Driver Aileen Collins-Love! Aileen finished in 3rd place for the Eagle Jet Top Gun Series Points for the 2016 season. She improved upon her 10th standing in 2015, and worked hard all season to showcase her talent behind the wheel. Top Alcohol Dragster Drag Racer, Megan Meyer, was your Most Improved Woman of the Year Runner-Up for the 2016 Horsepower & Heels Women of the Year Awards.